If one has French-Canadian roots, comes from the northern states, or is an adventurous cook, chances are excellent that some of these not-to-be-forgotten food, or others like them, have come across your plate. If that is the case, you'll agree with me that these are recipes that will end up in your recipe file only if you are trusted by someone from this area. These foods have been tweaked lovingly by each family and have been handed down to family member for decades. Now that you know the whys, let me introduce you to some of the best how-to's that you will ever experience. As Julia Child would say, . This is a French Canadian recipe. It is short, sweet, and VERY good! (tres bien!) 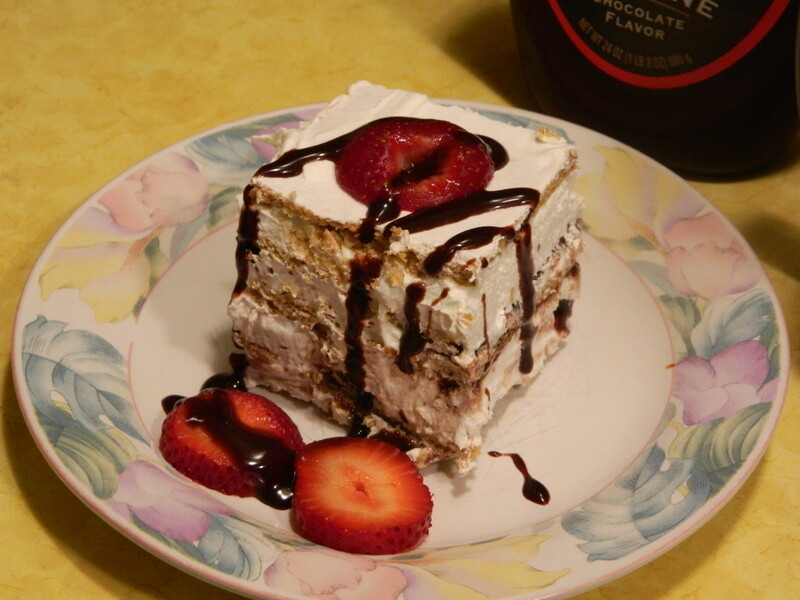 You must make it 24 hours before you need it, as it is a no-bake, but everything intermingles in the refrigerator. Voila! Instant cake from graham crackers. Depending what size cake pan one uses, is what will determine how much you need for ingredients. If you use a simple 9 x 9 square pan, that will cover one box of graham crackers and one container of whipped topping. If you use a 10 x 13 glass baking dish, use 1 1/2 boxes of graham crackers and 2 containers of whipped topping. Put a single layer of graham crackers on the bottom of the cake dish. Mix chocolate with whipped topping(to taste), and spoon out onto graham crackers, enough to soak in while in the refrigerator, about 3/4 inch. Repeat for 4-5 layers. End with whipped topping. Garnish with whatever fruit you fancy. Have a ball! 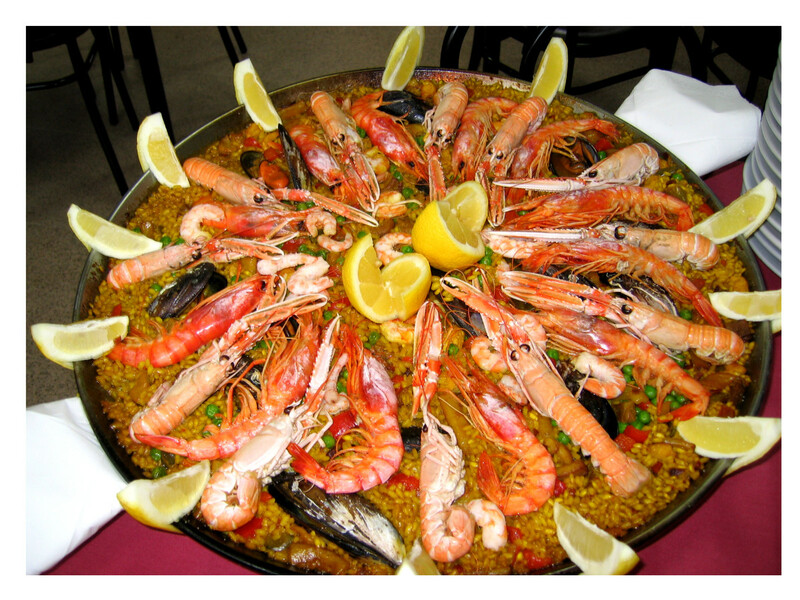 This isn't quick or for the diet conscious, but once you taste it, you will remember it for the rest of your life. The consolation is that it is very easy, since the advent of frozen pie crust. If you'd like it to taste even better, whip up a quick couple of crusts, and double the recipe, as your family will not settle for just one piece. This has been passed down for two centuries, and I assure you, it is a masterpiece. If you use a food processor or chopper, you'll cut down the prep time to next to nothing. 1. The night before, combine the first 13 ingredients in a large bowl. 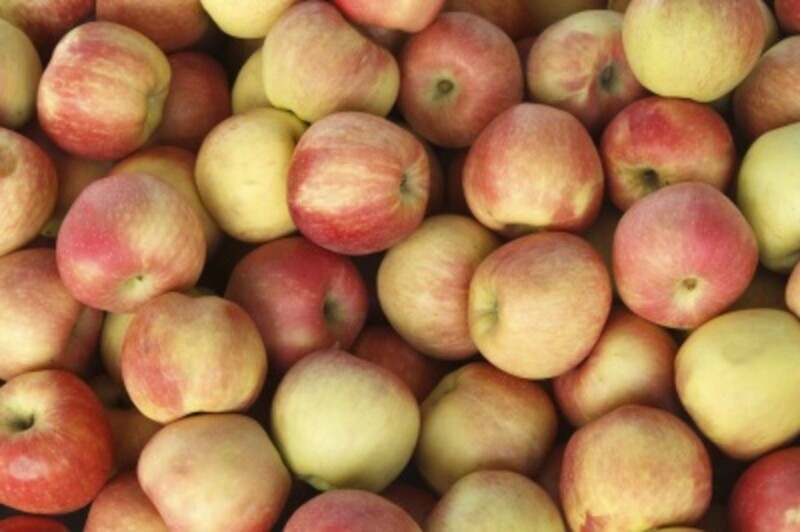 Cover and let rest overnight in the refrigerator. 2. 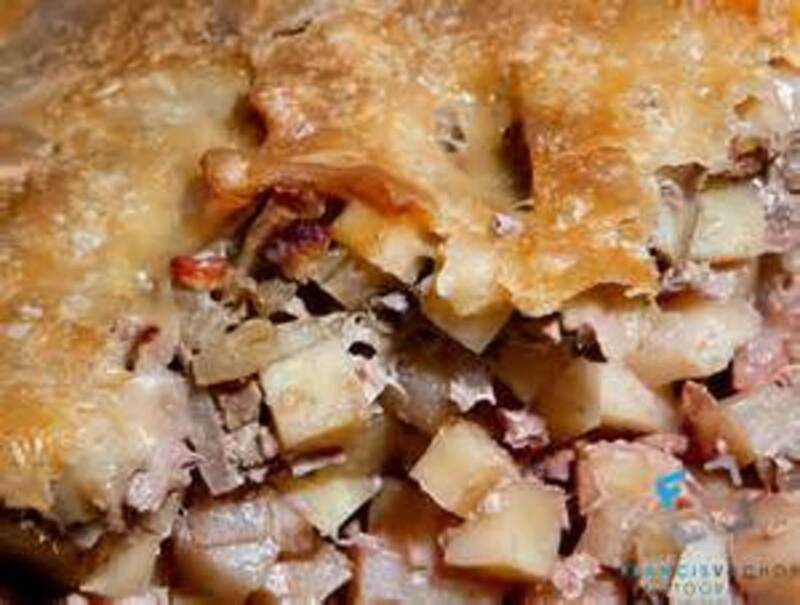 The next day, prepare potatoes and then prepare pastry. 4.Use 2/3 of pastry to line the bottom (not the sides) of a 4 to 4-1/2 quart coverable pot. 5.Add potatoes to the meat mixture. Pour mixture into pastry lined pot. Add boiling water. 6. Roll remaining 1/3 pastry and cover mixture. Make slits to allow steam to escape. Bake uncovered, until top is golden brown, about 20-25 min. 7. Cover, reduce oven to 300 degree F, and continue baking for another 5 hours, until meats are tender. 8. Uncover and let rest about 5 minutes. Pea soup? Oh, right, you hate pea soup, and that is most likely because you haven't had real pea soup. I'm talking about soup with flavor, not canned soup with no personality. The secret to pea soup is a base before you even get started and you have finally come to the right place to see where it is done properly, and that is in a French-Canadian kitchen. The night before, rinse and soak peas. In the morning, rinse again, then bring to a boil in a heavy stockpot. Remove from heat and allow to sit for an hour. Add salt pork or ham, the vegetables and the bay leaves. Bring to a boil, reduce heat and simmer for a couple of hours until quite tender. Add more water if necessary while cooking. Remove salt pork or ham bone, chop meat or pork, then return to pot. Remove bay leaves. 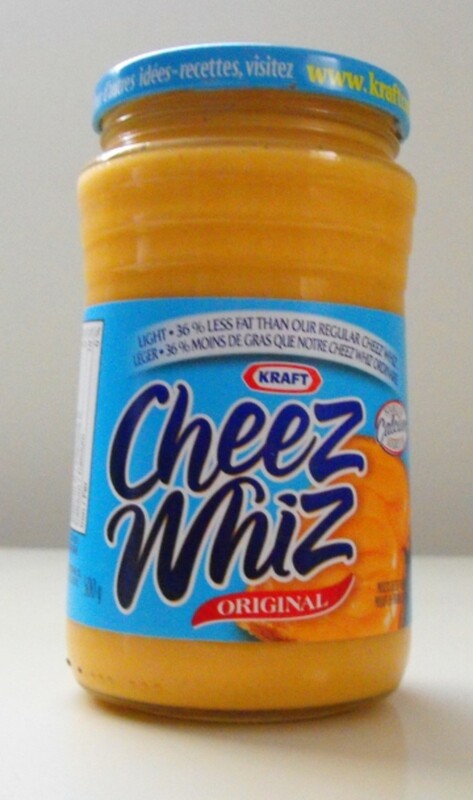 Are the Ingredients in Cheez Whiz as Healthy as Real Cheese? With pleasure! How have you been? Are you on Facebook? If so, please friend me and I will show you my bird photos. Seems delicious...Thanks for sharing the recipe! Chitrangada, it is simple, but elegant, as you can dress it up like I did. This sounds different and delicious! I haven't heard about Refrigerator cakes earlier. And since it is a no bake ake, I presume it will be simple to make as well. Your combination of ingredients sounds interesting . Thanks for sharing this interesting recipe and I would love to try this. Try it when you get the chance, unknown spy. It is truly a winner. Awesome Deb! very tempting. 5 stars! Molometer, truly you will love this. I know, the first time I did. I've had this recipe for 30 years! Daisyjae, with all our busy schedules, it is important to have all the timesavers that we can. I sure understand that, especially since you have little ones. This sounds absoluetly delicious and I love easy dessert recipes like this one. 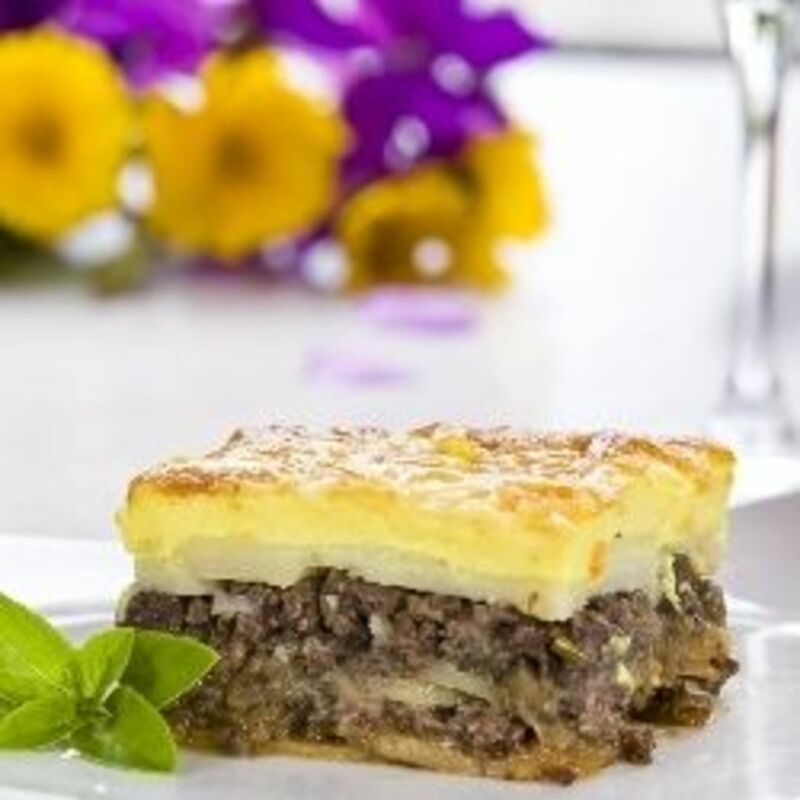 These kinds of recipes are hard to get, as the French Canadians don't share a lot, unless they know you. I lived in a small city in Maine, where a lot of them settled. Thanks, unknown spy. There are so many good and simple recipes out there. Unless you known French Canadians, you usually don't find any of their recipes. You're very welcome, Pamela. It is such a gem, as it requires no trouble at all. I love this recipe.. we call our alternative the mango float here. very delicious! That cake looks absolutely fantastic and not hard to make either. Thanks for the recipe. Glad that you think you'll like it, madmachio. emilyb, it is so simple. That's why I have to wait so long in between refrigerator cakes. The ice box does all the work. So simple! Sounds great! Will have to make this sometime. Thanks, Kaili. I really did have it for breakfast this morning before I went out to the lake to take pictures. Kalli, sure they would. I had fun making it! Looks so good. Easy to make too. Voted Up. Oh my gosh aviannovice. This sounds so good and so easy. I'll bet kids would have fun helping to make this. And I REALLY like your breakfast of champions :-) Voted up!